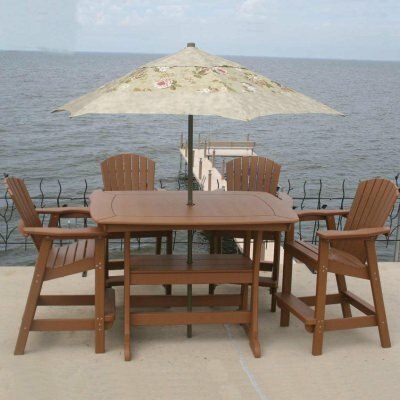 Time tested and relaxer approved, these Adirondacks are sure to be a perfect fit for your outdoor setting. 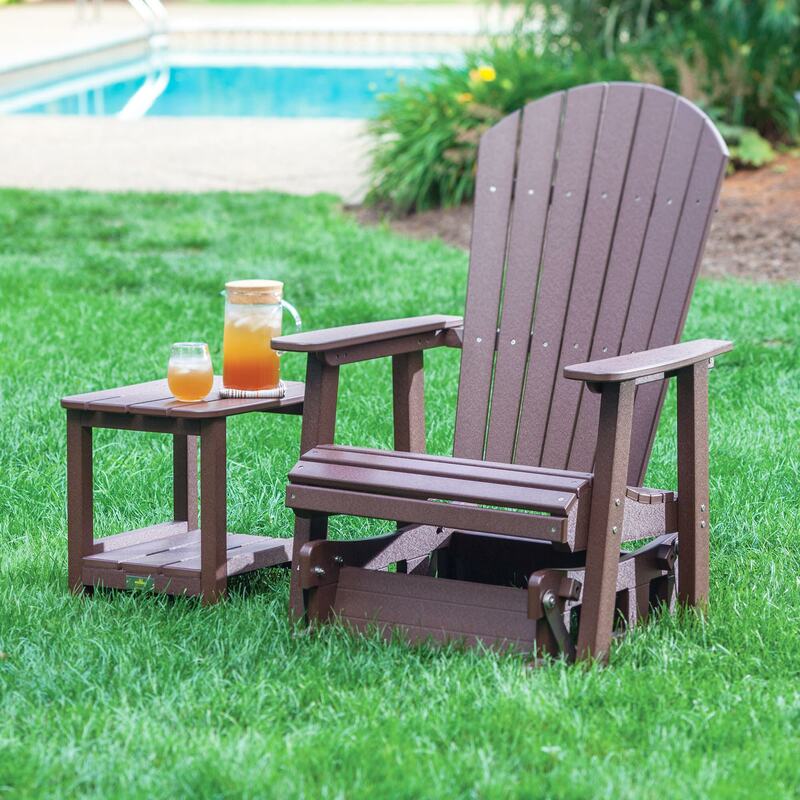 Perfect for you and another, these double Adirondack Chairs are as good as they get for comfy outdoor seating. Normal rocking chairs are great and all, but they pale in comparison to these Aidrondack Rocking Chairs. These Furniture Sets give you everything you need, in almost any atmosphere without worrying about not having everything you need. 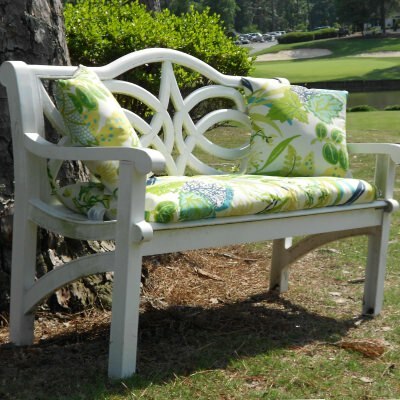 The perfect accent to your garden or outdoor space, these Benches and Settees add both attractive seating and unique conversation piece. This selection of Outdoor Sofas and Deep Seating arrangements offers comfort, looks, and durability all in one clean package. 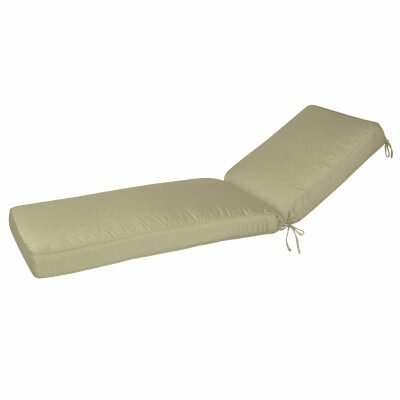 Comfortable seating is tought to come by sometimes, but not with these Outdoor Gliders! When you need a bit of shade outside on the patio, these Umbrellas can remedy that problem with style. 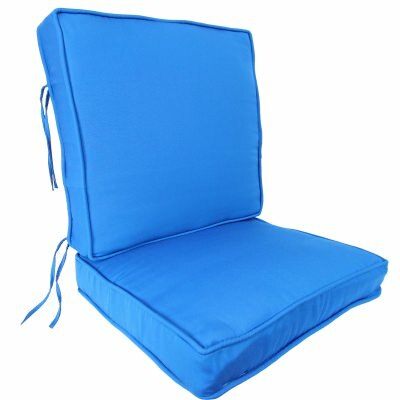 Comfortable and attractive, these loungers make a great addition to the edge of a pool or patio. Nothing helps out an Umbrella like an attractive and sturdy base in your deck or patio. Browse through our entire selection of Outdoor Seating, your sure to find something that’s perfect! Browse through our entire selection of Outdoor Seating on clearance, your sure to find something that’s perfect for a great deal! 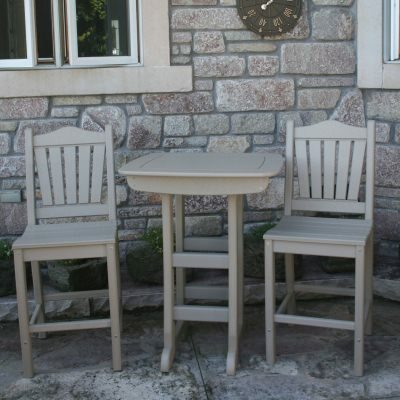 Perfect for the dining table, these Dining Height Outdoor Chairs are the perfect accessory to an outdoor eating space. Tall and comfy, these Counter Height Chairs can provide you with a wonderful place to gather with friends. Ideal for a beverage with those close to you, these Bar Height chairs provide a great outdoor gathering point for friends. A perfect piece to gather with family and friends for a meal, these Dining Tables are as comfortable as they attractive. If you need a little bit of table top but are strapped on space, these Side and End Tables are the way to go. A perfect low table like these Coffee Tables to gather with friends and those close to you to encourage conversation and comradery. This assortment of Conversation Tables do exactly what you'd expect. They provide a locale for conversation, and boy do they do it with style! 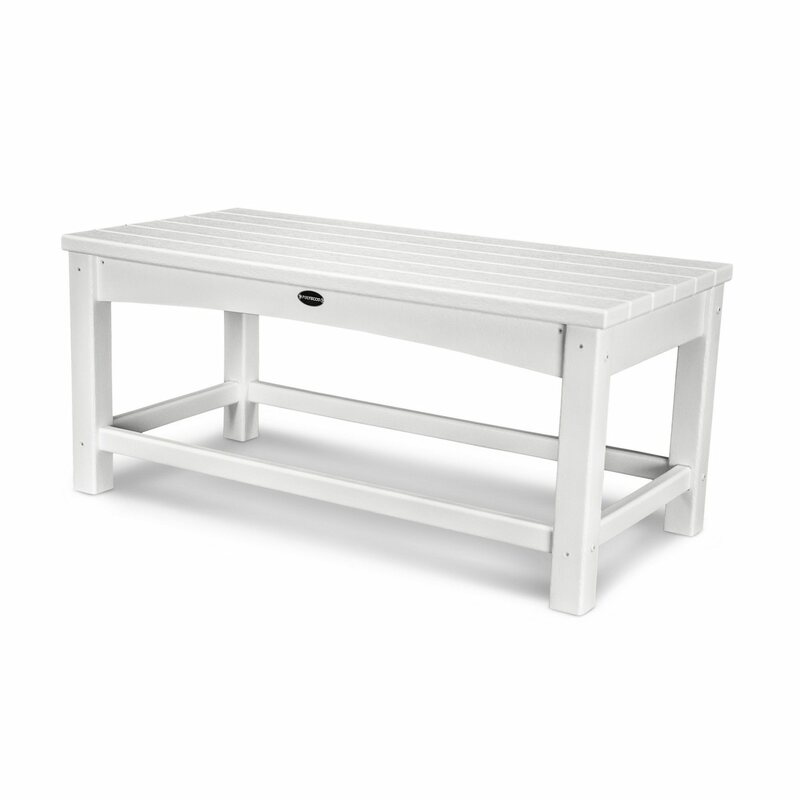 Take a look through all of the tables we have, your sure to find one that matches what you need. 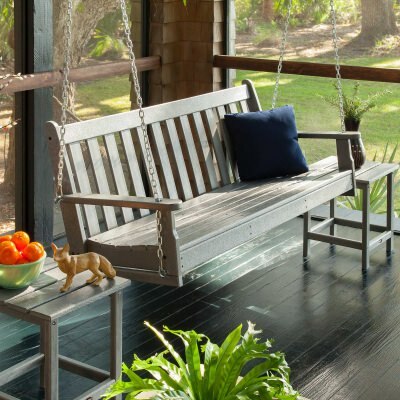 Single Porch swings take all of the comfort of the being on the porch, and adds in the soothing relaxation of a swing. A winning combination to be sure! The only thing better than a porch swing, is enjoying one with a friend! These Double Swings allow you that luxury in an attractive package. Say you don't have a spot for a swing, if this is you then we've got you covered. These Swing Stands offer a portable alternative. 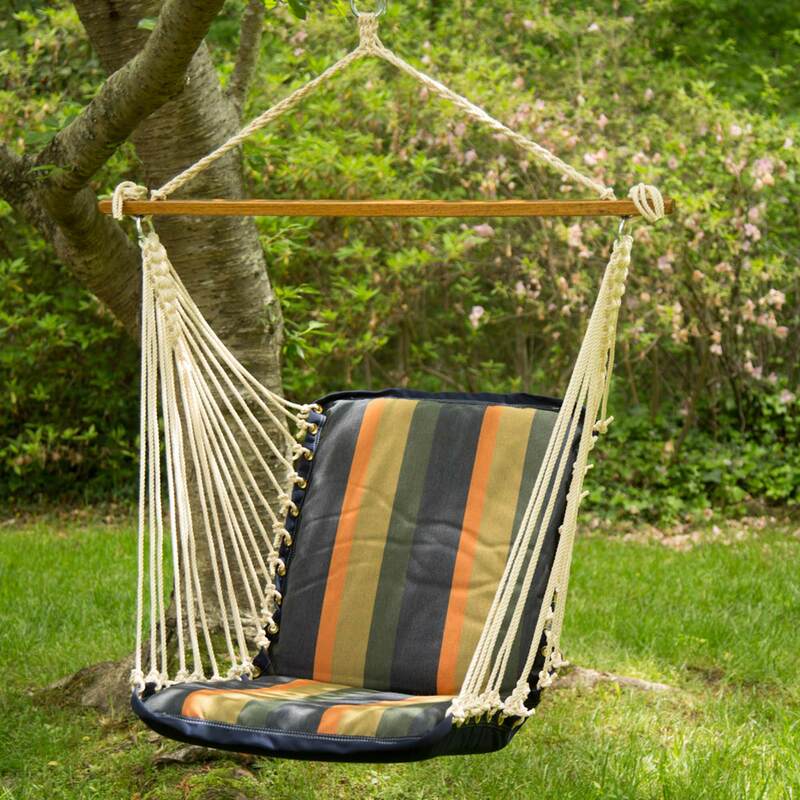 Browse through all of our Porch Swings to get a feel for what works best for you. Sometimes when your laying out in the outdoors and already relaxed you just feel something is missing. One of these Cushions should solve that! 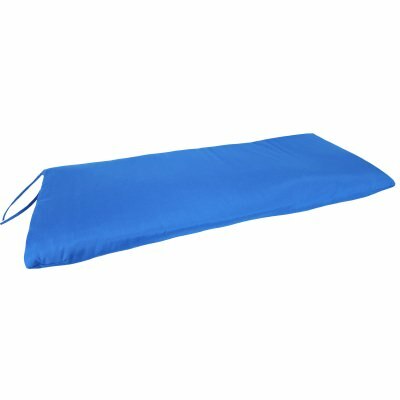 The easiest way to take your Adirondack chairs and other patio furniture to the next level is with an outdoor bench cushion. 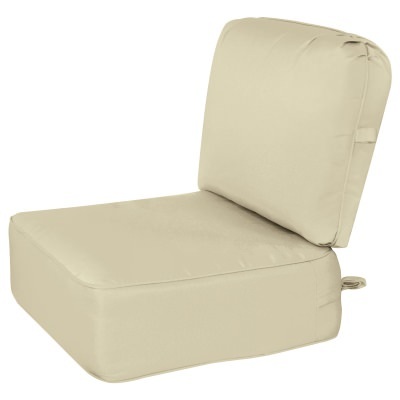 This wide variety of Chair Cushions should give you innumerable options to improve your relaxation experience. These Loveseat Cushions are the perfect compliment to your loveseat, adding a new dimension of style and comfort. Adirondack Chairs are immensely comfortable. These Cushions however, can take that to the next level. 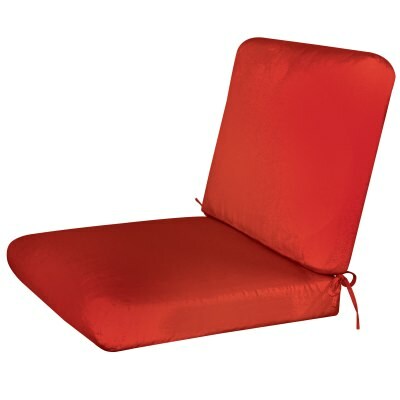 Colorfast, durable, and comfortable are just a few of the words to describe these incredible Deep Seating Cushions. Take a look through all of the Cushions we have, you're sure to find something that fits your style. When you want to relax nothing epitomizes that feeling like kickin' up your feet. 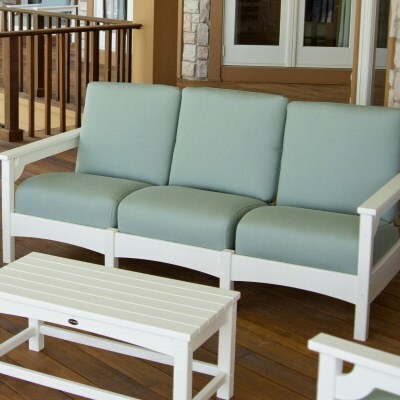 These Patio Furniture Accessories are the perfect addon to your outdoor setting. What Sets Patio Furniture at DFOhome Apart from the Competition? Set the tone for your outdoor space with your choice of fine outdoor furniture. Browse our collection of outdoor chairs for an unparalleled selection of dining and Adirondack seating. Create a relaxing backyard destination with our rockers, gliders, and lounge chairs. Mix and match, or check out dining sets built to match in a variety of colors. 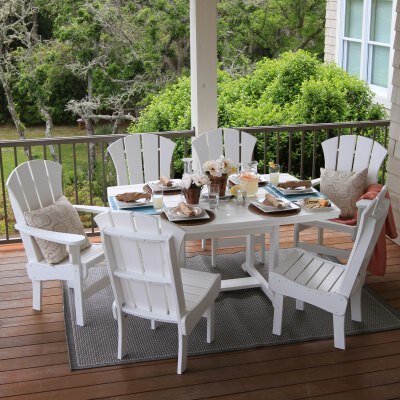 Keep an eye out for new collections from Pawleys Island porch furniture, our top manufacturer of premier DuraWood furniture pieces manufactured from recycled lumber. 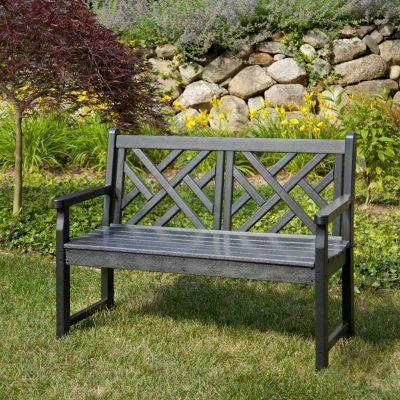 Outdoor benches and settees provide convenient vantage points for your garden or bird feeder. 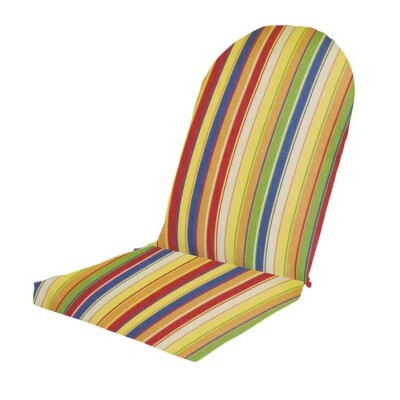 Accommodate your children and pets with custom-made outdoor chairs designed just for them. Once you’ve put together the perfect patio furniture arrangement, complement the set with shade from our peerless selection of fine patio umbrellas. Secure your patio umbrella in a table with a prefitted umbrella hole, or use one of our many weighted bases to secure it firmly in place anywhere in your yard. At DFOhome, we understand the importance of selection. We bring you unique designs from across the country in order to help you find exactly what you're looking for. But we don't skimp on quality – all of our brands have met a standard of excellence we feel is worthy of our customer's business, and we stand proudly behind our entire Adirondack line. 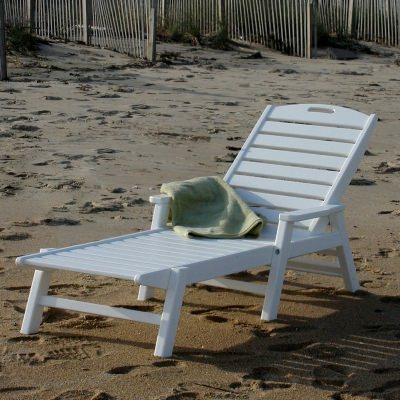 We consider Adirondack Chair style to be more than simply chairs and other furniture, but a frame of mind. 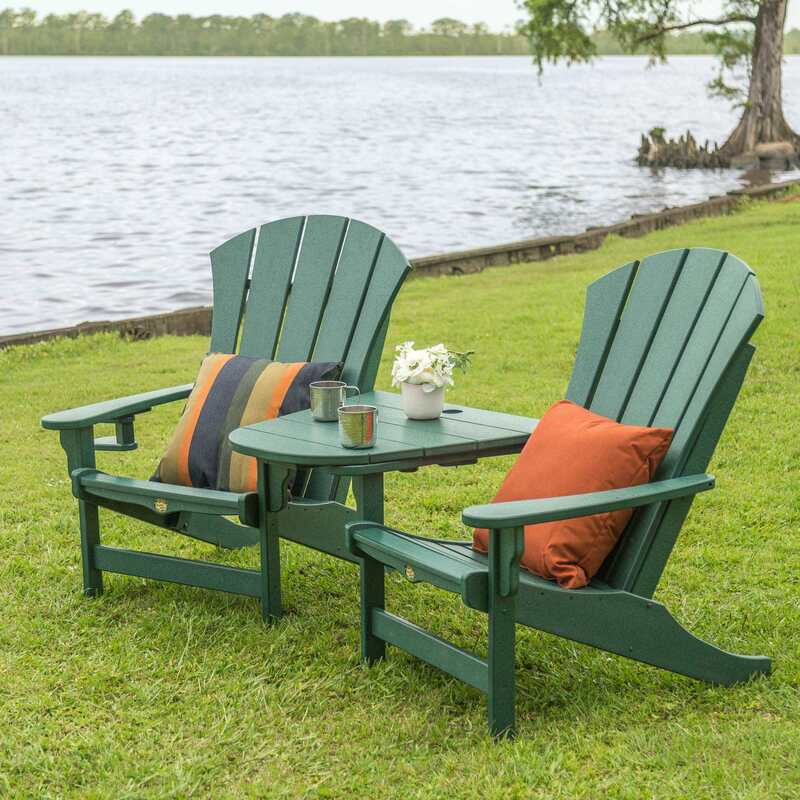 Adirondack equates aggressive relaxation, a New England design with Southern influence – truly an All-American design. 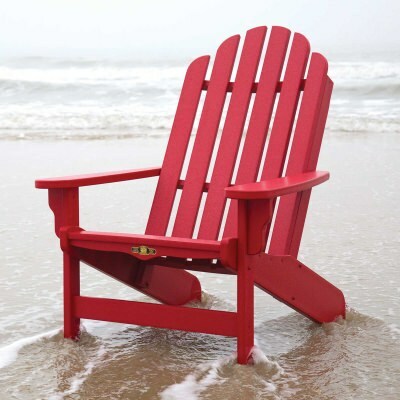 You can learn a little bit more about the origin of Adirondack chairs and the story of their development on our Adirondack History page. Single and Double Adirondack Seating are plentiful and affordable here! 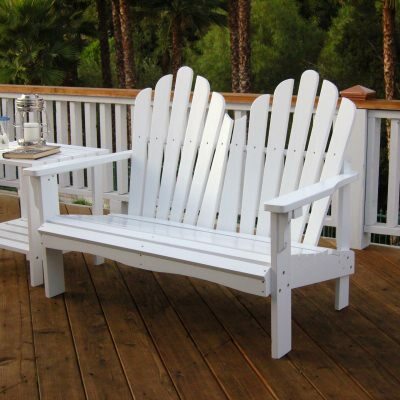 You'll find single and double occupancy Adirondacks in a variety of materials and styles. You'll see fan and straight backs, wide and narrow slats, in several varieties of wood and as many as 18 colors in plastic. Porch Rockers are another mainstay of our collection, and we've strived to deliver to you the best of the best in that regard. 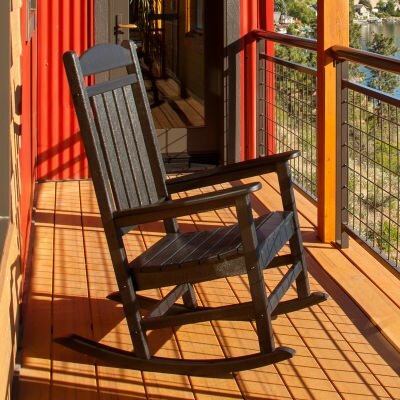 You'll find many familiar Adirondack-style rockers, as well as other contemporary designs. We have Ottomans to match any Adirondack rocker or regular chair as well. Some ottomans will even rock along with your Adirondack! Check the "Recommended Accessories" on any item detail page to find your rocker's corresponding ottoman. 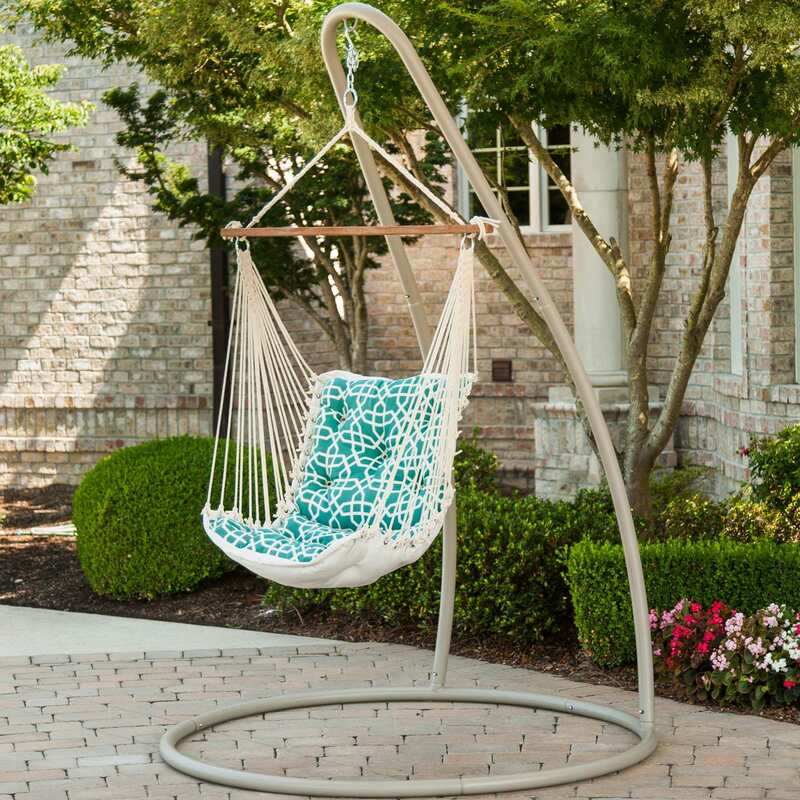 Swings are an aspect of our wide outdoor furniture offerings that you may not have considered. 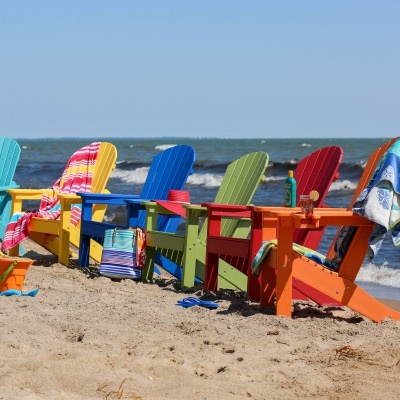 Think about this – many of our swings are constructed in similar Adirondack styles to chairs of the same brand. The potential for matching a set of chairs and swings exists for many designs. 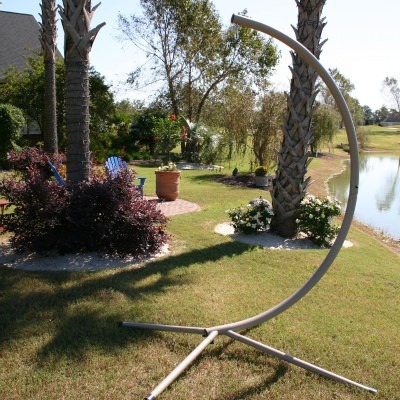 Worried about finding a place to hang your swing? No problem – we also offer affordable combo packages that include an a-frame, allowing you to give your swing added presence in your yard. 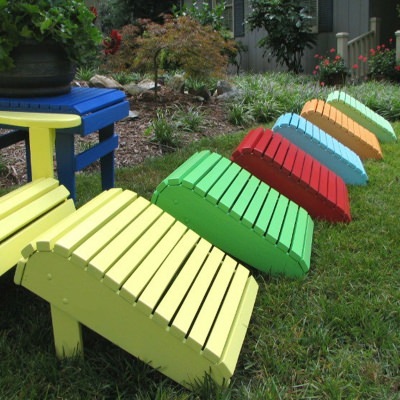 Patio Benches includes benches in both Adirondack and more traditional styles – think "garden bench." We've also got backless benches with contoured seats, as well as a high-quality poly-recycled bench reminiscent of old school park benches. For a more rustic look, be sure to take a look at our Cedar log-style benches – perfect for the true outdoorsman's backyard! Gliders are increasing popular as a contemporary alternative to rockers. We have both double and single varieties, all in similar styles to our chairs and benches. You sacrifice none of the Adirondack style for a rejuvenating, peaceful rocking motion only gliders provide. Lounge Chairs on our site are styled after the Adirondack tradition, and are available in wooden and poly-recycled varieties. 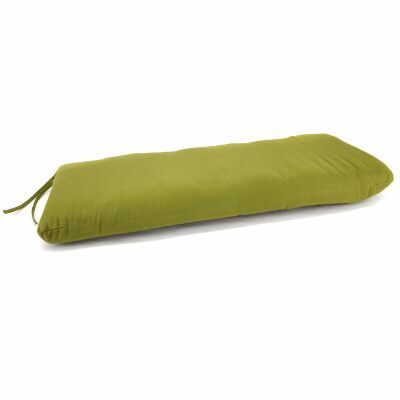 They're adjustable, and many are offered with specially designed, all-weather cushions for added comfort! 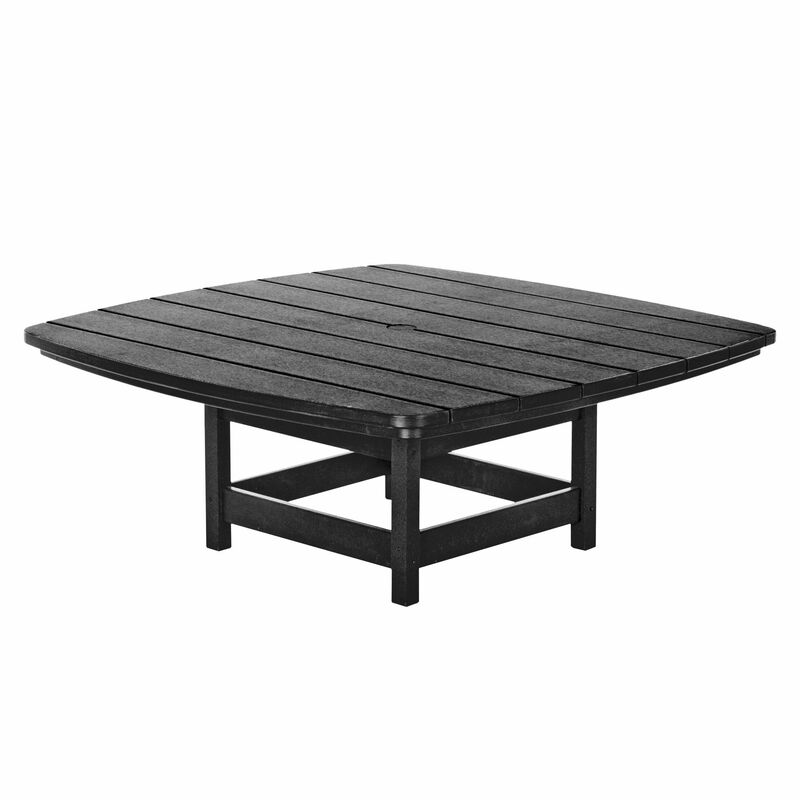 All Weather Coffee Tables and Side Tables are great either as a centerpiece for an outdoor space, or an accessory alongside Adirondack chairs. Varieties run the gamut from small side tables with useful shelves, to larger coffee tables. 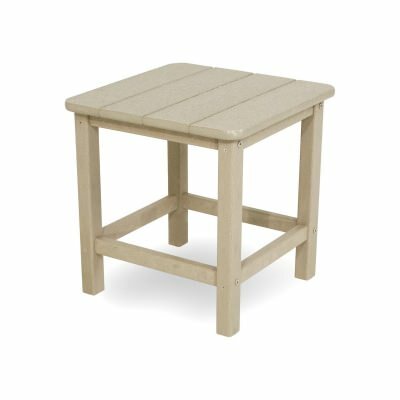 You'll find these tables practically useful as well as stylish, as they're available in the same colors and materials as our Adirondack chair lines. 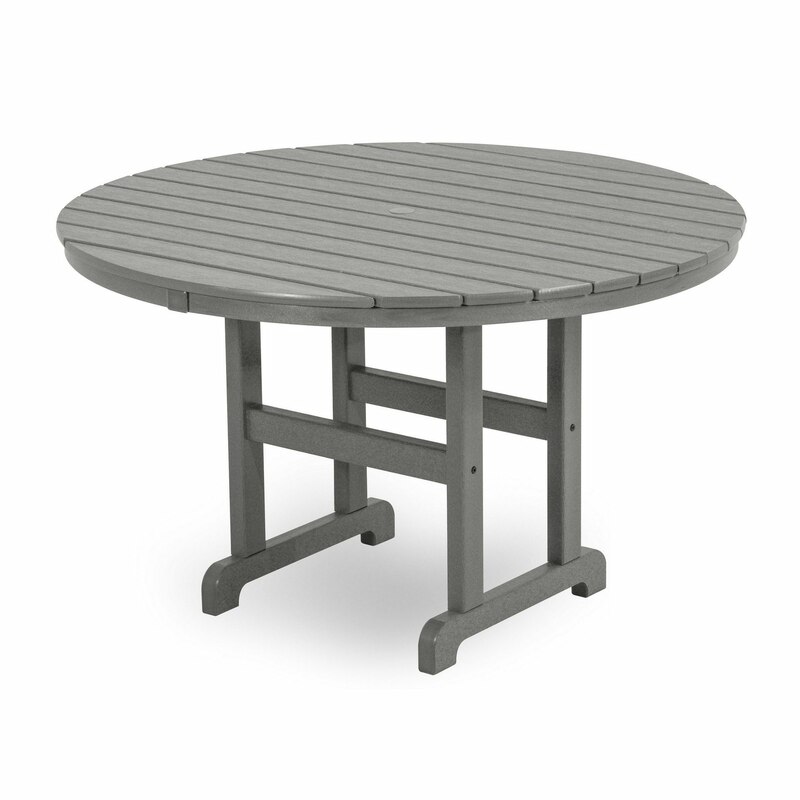 Need the perfect dining set for your deck or patio, but aren't sure where to start? You'll find tables with heights ranging from 28 to 31 inches in Regular Dining Sets, which also includes chairs suited to that traditional dining furniture height. For a mid-range height level, see our Counter-Height Dining Sets, which range from tables of 32 to 37 inch height. Our tallest pieces are available in Bar-Height Dining Sets, featuring tables ranging from 38 to 41 inches high, along with high dining chairs to match. We only carry those materials that are outdoor-ready straight out of the box. Though some wooden varieties come pre-stained, no staining is required on any of our unstained furniture -- though it can be an appealing personalizing improvement if you're a do-it-yourselfer! Cedar wood is used in outdoor furniture because of its natural resistance to rot and decay. It does not need to be chemically treated. Cedar is a natural choice for any outdoor setting, and a standout material in our outdoor furniture lines. Cypress wood (Taxodium distichum) comes mainly from the southeast and is reputed to be one of the most durable wood for outdoor uses. It is a sought after wood for usages that requires high durability against moisture. Cypress wood contains a natural oil called cypressine that prevents the wood from rotting, mildewing and it keeps insects and termites away. 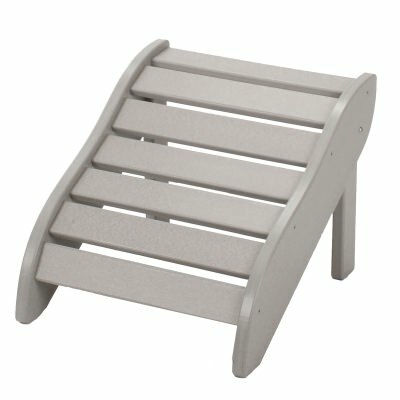 Non-stained Cypress wood features a white finish that will age to a silver pewter gray overtime. 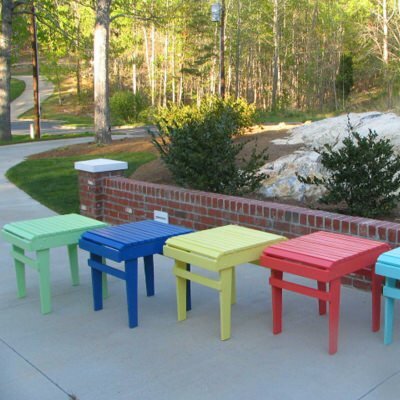 Poly Lumber furniture is made from High Density Polyethylene (HDPE), a plastic resin made from recyclable plastic materials such as milk jugs. Poly Lumber will never need to be painted or stained, it will not rot or splinter, and contains added UV protection to resist fading. It will not promote bacterial growth or mildew, and will remain unharmed from snow and rain, year after year. Poly Lumber furniture is not affected by most corrosive substances and features stainless steel hardware. Acacia and Eucalyptus are tropical hardwoods that feature the same texture, color, density and heaviness of teak. Acacia and Eucalyptus are a good alternative to teak, as it is becoming increasingly difficult to obtain. Acacia and Eucalyptus are more abundant and therefore easier to obtain -- and more affordable, too!